New Scientist magazine's web site features Clark School of Engineering cross-disciplinary research into "Cell Sensor-Based Pathogen Detection." The research team includes Associate Professor Benjamin Shapiro (AE/ISR); Assistant Professor Pamela Abshire (ECE/ISR); and Associate Professor Elisabeth Smela (ME); as well as D. Wirtz, Johns Hopkins University; R. Das, Walter Reed Army Medical Center; and H. Mattoussi of the Naval Research Laboratory. In the article, Shapiro explains the problem with biochemical weapons detectors is their unacceptable number of false positives. Existing detectors are easily fooled because they cannot distinguish between the subtle ways pathogens interact with biological systems. To solve this problem, Shapiro, Abshire and Smela's research uses biological systems that incorporate real cells to spot the pathogens. The cells are exposed to potential pathogens in the air via a semi-permeable membrane. Much like a canary in a coal mine, these cells die when exposed to a particular pathogen, triggering an early warning. They also are engineered to produce a signal, such as fluorescence, when attacked. The system then quickly realizes pathogens are present. 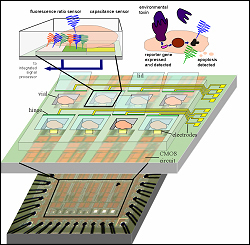 The cells are stored on a chip that keeps them alive and monitors the light they produce.